Does the ambient noise in your home cause problems when you want to record your podcast? Perhaps the Pod Mini is something that can help with that. It is a pop-up soundbooth that can be placed over you and your equipment while you record. PodMini is on Kickstarter. At the time I am writing this post, it has 10 days to go. 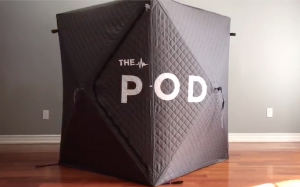 The Pod Mini was designed to be a pop-up soundbooth, for shared work areas or travel requirements podcasters often run into, such as podcasting on-site during events. While the Pod Mini isn’t 100% sound proof from exterior noise (this is physically impossible in a portable unit), the quilted interior fabric in the walls dampen exterior sounds and echo from inside. The Pod Mini is large enough for a small desk and stool. Or, you can put Pod Mini over the top of you sitting on the ground. There is no floor in the Pod Mini, so it’s easy to pop over and start recording. The size is 120cm x 120cm x140cm. There are ventilation windows on top to ensure air flow for the podcaster’s comfort. The Pod Mini might be a good option for podcasters who are currently attempting to turn a closet into a tiny recording studio. 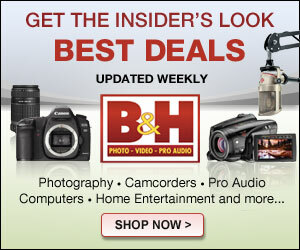 It also could be useful for podcasters who need to record on location at conferences or other important events. Earlier this month, Anchor released redesigned analytics for their desktop dashboard. Now, they announced brand new mobile analytics. It lets Anchor podcasters see their analytics on the go. Anchor’s redesigned analytics includes new features: Estimated Audience Size, Upgrades to current stats, and the ability to see where listeners are hearing you. Anchor podcasters were first able to view these new features in their web dashboard. Estimated Audience Size is the average number of plays your episodes get within 30 days after publishing. Anchor says this is a great indicator of how many people are listening to your podcast. Upgrades to current stats have also been implemented. The podcast plays chart in the Anchor dashboard now gives podcasters the ability to see which episodes are driving the most listens. Podcasters can now see when they published each episode and which episodes most contribute to peaks in your plays. The Anchor analytics now have a listener geolocation chart that lists the countries around the world where an Anchor podcaster’s audience is hearing their podcast. 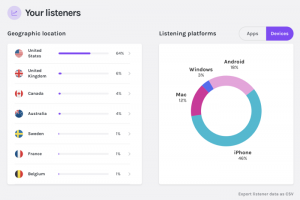 It shows a breakdown of what platforms listeners are using to hear your podcast. There is also a way to sort your episodes list. Anchor says that they had been asked to give podcasters the ability to see their analytics on the go through the Anchor app. 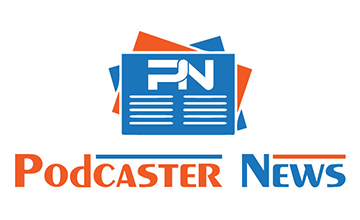 As of March 21, 2019, the Anchor app has the same analytics information that podcasters can access through their web dashboard. Patreon has made new creator plans. The new plans are called Patreon Lite, Patreon Pro, and Patreon Premium. Podcasters who are considering using Patreon for the first time should take a close look at these plans. The Premium plan is for established Creators and creative businesses. It will have limited openings at launch, and will be rolled out gradually as spots become available. In addition, Patreon is changing the payment processing rates on pledges. These changes will affect future Creators. Founding Creators will have the same processing rate that they currently have. For all pledges from patrons outside of the US who use PayPal, regardless of the amount: An additional 1% per successful pledge. The payment plans are a little confusing. It is different from the December 2017 fee changes Patreon made. Patreon says that it learned that “the right way to build a sustainable Patreon is to charge creators, not their patrons.” Personally, I think these three new plans are designed to push out smaller Creators so that Patreon can make more money off of the “whales”. Google Podcasts Creator Program round two is accepting applications. Teams will that are selected will receive months of training, mentorship, and up to $40K in seed funding. The deadline to apply is 11:59 p.m. ET, Sunday, April 14, 2019. Google and PDX designed this podcast accelerator program to lower barriers to entry and elevate underrepresented voices across podcasting. Last time, they received thousands of applications from over 100 countries. In the first round, they chose six incredible teams. We’re looking for people who want to invest in and who are making shows we’re excited to help grow. The strongest applicants made clear why they are the team not to just create any podcast, but to create the specific podcast they’re pitching. They also want to know who you think is your perfect listener. What do they care about? The team reviewing the applications may not be your target audience, but the more you demonstrate you know who you’re trying to reach, the more the team will trust that you’ll find them. In the first round, the applications that got their attention had a story to tell. They had driving themes instead of loosely structured conversations. They sketched episode outlines and season arcs that allowed the team to hear the show. It is recommended that you read the Frequently Asked Questions page before sending in your application. It provides information about what they are looking for, what they are not looking for, the criteria they use to select the winning teams, and more. 10er lets fans support their favorite projects with automatic, recurring donations. You can let your content stay free while letting your loyal fans contribute with their credit cards everytime you publish. In my opinion, 10er is an alternative to Patreon. You find a podcast that you enjoy and that you want to contribute to. You sign up on 10er with a pledge to support that podcast. It appears that your pledge can be $1, $2, $5, or $10. Pick an amount, and that is what you will pay per episode to the podcast you want to contribute to. The podcaster receives donations from their listeners through 10er. This enables the podcaster to continue making podcast episodes. There is a list of all the projects that are on 10er. Many are podcasts, most are Danish. Some are blogs, some are videos and one is a poet. 10er is for recurring donations. It is not for one-off donations. 10er keeps 10% of a donation (plus VAT where applicable) and the projects pay the processing fees. 10er charges once a month per subscription for the previous month’s creations. It is possible to change or cancel a subscription. It is possible to delete your account. Podcasters who are not happy with Patreon might want to consider giving 10er a try. 10er is made, run and used by Brainbox, Mikkel Malmberg as a company. It is an open start-up that posts how much money it makes and what some of that money goes to. CAFE is a media venture developed in partnership between former U.S. Attorney Preet Bharara and Some Spider Studios. They are seeking an Audio Producer. CAFE is looking for an experienced New York-based audio producer/editor with passion for news, justice, and startup culture to execute the full production of two weekly podcasts, from pre-production to recording, editing, and publishing. Visit the CAFE website to find out about the benefits that come with this position, and to apply for it. Voxnest announced that it has partnered with Jamendo, an independent music platform. The deal will have benefits for both companies and their users. Jamendo’s musicians will be able to offer their compositions via Voxnest’s sister platform, Spreaker, and Spreaker’s users will be able to license music from Jamendo. Jamendo’s users will have the opportunity to create professional sounding podcasts with Spreaker, as a way to promote their music and develop and additional revenue stream, via sponsorship or programmatic ad insertion. Podcasts are the perfect medium for musicians to create a narrative about their songs and tours or build an intimate conversation with fans. Agencies and publishers who are already licensing music from Jamendo now have professional tools to create and distributed branded audio content at their disposal. For Spreaker’s podcasters it means access to 9,000 active artists and more than 200,000 tracks to use in their show. I think this collaboration could be good for podcasters. It is very important to make certain that creator of the song you want to use in your podcast has allowed it to be used under creative commons. Some dedicated music podcasts get music submissions from bands and labels, who want the podcaster to play their music on the podcast. The Voxnest/Spreaker partnership with Jamendo appears to protect the rights of music creators and gives podcasters a way to ensure that they can safely play that music on their shows. Wondery tweeted: “We have decided to part ways with Mike Boudet and Sword and Scale.” The tweet was posted on March 9, 2019. Sword and Scale was first hosted on Wondery in 2014. It is unclear exactly why Wondery decided to part ways with Mike Boudet and the Sword and Scale podcast. Wondery’s tweet did not provide any background information. That being said, The Wrap appears to have some ideas about what may have caused Wondery to part ways with Sword and Scale. According to The Wrap, Mike Boudet posted something offensive on Instagram which included a derogatory word that some people use when they want to say something mean about a woman – or women in general. The now deleted post on Instagram was posted on International Women’s Day. But, we cannot conclude, for certain, that the Instagram post was what made Wondery part ways with the podcast. The Wrap has provided additional examples of Mike Boudet making derogatory or sexist comments. One can only speculate about what offensive comment was the last straw for Wondery. The Wrap reported that Mike Boudet responded to Wondery’s decision in a Soundcloud file. He said that Sword and Scale will move to its own platform behind a paywall. CBC Podcasts’s diverse and award-winning collection of series is growing! They are looking for highly-skilled and creative audio producers to work on short-term projects and pilots. This is an opportunity for freelance producers, podcasters, and current CBC staff to pitch ideas and/or themselves. We are always on the lookout for potential show-runners, narrative-driven storytellers/script writers, chase producers and researchers who have demonstrated experience in audio mixing and sound design. Talent that can pull it off. Show us your take on what’s on paper and turn it into radio or podcasting gold. Include links to work that show your ability to execute. Long legs. We want concepts that won’t run stale and can continue for multiple seasons. Regular releases. For radio, we’re looking for weekly shows, usually 30 minutes long. For podcasting, at least 20 episodes a year. Understand the audio space and audiences. You have a firm grasp on whether radio or podcasting will be the best medium for your idea. Ideas that can succeed on both are welcome but not a prerequisite. Visit the CBC Podcasts website for more details, including where to send your cover letter and resume, and the learn about the pitch process.